Riding Into History’s 13th annual poster for the year 2012. The motorcycle is a 1983 ZX 750 (GPZ) Kawasaki, 750cc, DOHC, transverse, inline four, (as ridden by Wayne Rainey, in the Superbike Class). Made in Japan. “Tomoe Gozen” of twelfth century Japan was a fierce and fabled Samurai warrior, renowned for her beauty and bravery. She was the wife of Shogun (Minamoto Yoshinaka 1154-1184) and fought beside him in all of his battles. 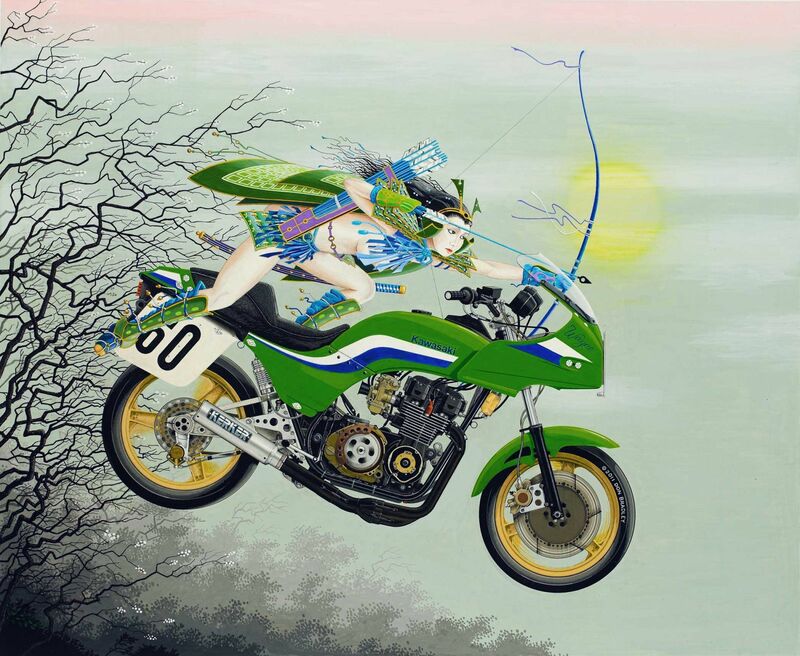 Illustrated here, she is doing battle mounted on a 1983 ZX 750 (GPZ) Kawasaki, 750cc, DOHC, transverse, inline four. Full size “Giclee” print 30.5″ x 25″ image, edition of 150, s/n, on acid free stock. From an acrylic by Don Bradley.